How does one move on after the sudden and unexpected death of a beloved friend, collaborator and inspiration? I guess I’m finding out the hard way. I’ve been very blessed in my life, and one of the biggest blessings of the last decade has been an ongoing musical and devotional relationship with one of the bright lights of the devotional chanting world, Bhakti yoga singer, scholar and translator Shyamdas. Shyamdas was born into a loving family in the West, but found his true home in the dusty north Indian plains, living much of his life within a stone’s throw of one of India’s hidden treasures, the Govardhan Hill. This area is the setting for some of India’s most transcendent devotional poetry, describing the life and exploits of Krishna and His beloved companions. Due in part to his 40+ years of study, practice and devotion to the living traditions which still thrive in that area, Shyamdas was uniquely gifted in his capacity to bring these stories, the Krishna lila, to life in a way that lifted the hearts and spirits of listeners around the world. Through his chanting of the divine names of the One who pulses through us all, and the unique way he would share pearls of poetic wisdom while gently coaxing transcendent sounds from his small harmonium, Shyamdas brought a bit of heaven down to earth, for us all to see, feel, and enjoy together. Every time I visited him in his temple home within sight of the old Sri Nathji temple in Jatipura, I met visitors from around the world who were also drawn by Shyamdas’ radiant presence—his knowledge, humor and generosity in welcoming travelers both famous and humble was renowned and a constant wonder to behold. We may have been paupers, students, or world-famous artists, but once we set out to circumambulate the Govardhan Hill and laid our bare feet on the Braj-raj, the sacred sands of the Braj region where Shyamdas lived and worshipped his whole adult life, we all became the same: simple pilgrims, humble humans seeking to absorb and align ourselves with the universal teachings that India has specialized in understanding, distilling and sharing for millennia. I will treasure those simple, contemplative walks for the remainder of my days. 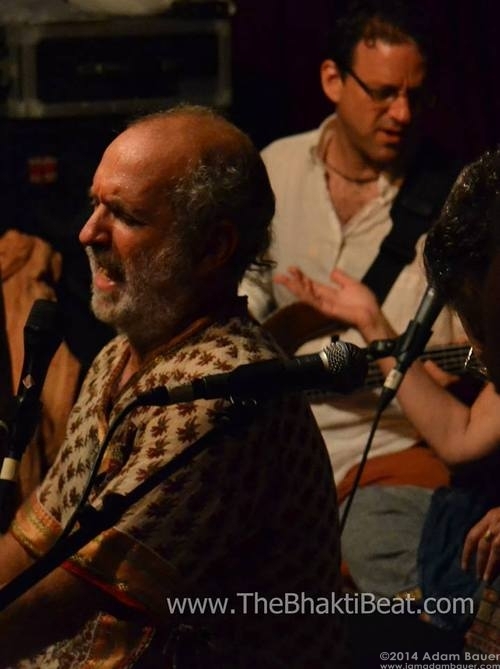 I was also extremely blessed to sit beside Shyamdas for much of the past decade, offering my heartfelt bass playing to complement and support his ever-flowing river of inspired songs, mantras, and teachings. He sang and spoke from his heart, from his own felt experience, and I’m not sure I’ve ever met someone who so fully merged his studies, his devotion, his teachings, into his life so penetratingly, so seamlessly. Visiting him in the USA was like being in a bubble of India; being with him in India was living in the old-school sacred India I was otherwise unsure still existed. In January 2013, on the 23rd anniversary of his own Guruji Sri Prathameshji’s mahasamadhi, Shyamdas left his body without warning, on a twisting curve on India’s ever-dangerous roads, where life is cheap and death lies in wait for all travelers. The shockwave of that unexpected passing is still reverberating in the worldwide yoga, Bhakti and kirtan communities. So, how does one move on? For me, the same things that drew me to Shyamdas—the sacred singing of the kirtan practice, the amazing kinship I feel with my brothers and sisters on the Bhakti yoga path, the undeniable recognition of my essential unity with all creation, the sheer joy of shared time with people we love—impel me on. Where once I concentrated on playing bass, now I feel driven to play my harmonium and sing—offering my own humble voice to the ever-moving current of life’s ebbs and flows. While I lack Shyamdas’ erudition, and both his scholarly and his experienced practitioner’s grasp of the deeper context and meanings of what he sang of, and his decades of immersion in India’s sacred traditions, I do what I can. I gather with friends both known and unknown, I sing from my heart, I weep real tears of both the joy of communion and the heart-wrenching solitude of separation. I keep walking, I keep loving, I keep weeping. And thanks to Shyamdas and all my teachers and inspirations, I know I will continue singing, and keep loving, serving, and remembering.